Whether it be natural disasters, animal attacks or acts of violence, some survivors have overcome adversity and lived to tell their stories. We bring before you 15 such people. We start off with Toya Chiba, a reporter for local newspaper Iwate Tokai Shimbun, who was swept by a tsunami at Kamaishi port, Iwate prefecture after it was hit by the March 11 earthquake and tsunami, in this photo taken on March 11, 2011 and released by Kamaishi Port Office via Kyodo on April 14, 2011. Chiba managed to survive the tsunami by grabbing a dangling rope and climbing onto a coal heap around 8 meters high after being swept away for about 30 meters. 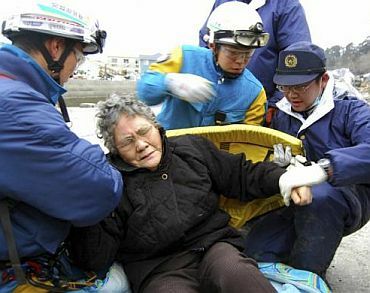 Eighty-year-old Sumi Abe is helped by emergency workers after being rescued from under the rubble in Ishinomaki City, Miyagi Prefecture, northern Japan, in this picture taken by Nikkei Shimbun on March 20, 2011. 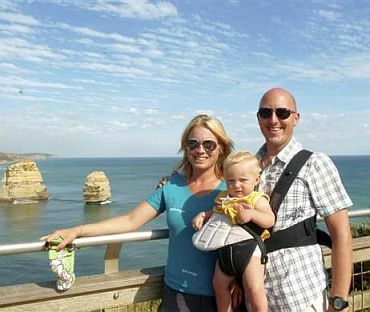 Stefan, Erika and Elinor Svanstrom overlook the Twelve Apostel rock formation in Victoria, Australia on March 7, 2011 in a private photograph made available to Reuters on April 14. The couple from Sweden just returned from what's likely the craziest honeymoon of all time. Stefan and Erika Svanstrom set out for their 4-month honeymoon on December 6th, and immediately got stranded in Munich, Germany during one of Europe's worst blizzards on record. From there they headed to Cairns, Australia, where they encountered a cyclone. After they cyclone hit, they were evacuated and spent 24 hours on a cement floor in a shopping centre with 2,500 other people. 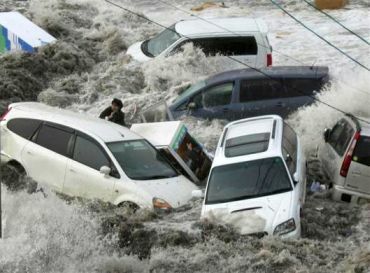 Next up was Brisbane, which was ravaged by floods. From there it was off to Perth, where they narrowly escaped some bush fires. And just before they arrived in New Zealand, the 6.3-magnitude earthquake hit Christchurch. Then it was off to their final destination: Tokyo. They survived the Japan quake, and returned to Stockholm last week. 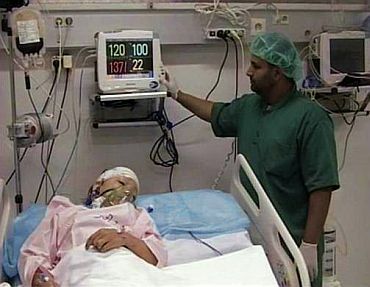 A frame grab shows a Dutch boy, the lone survivor of the Afriqiyah airline flight 8U771 crash at Tripoli airport, being treated in a hospital in Tripoli May 12. The Libyan Airbus A330-200 plane crashed as it tried to land, killing 103 people on board, most of them Dutch, leaving the young Dutch boy the sole survivor, officials said. 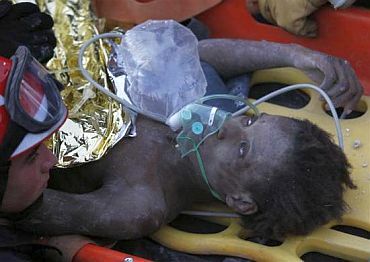 A Haitian girl is rescued by a French team after being in the rubble more than two weeks in Port-au-Prince January 27, 2010. The teenage girl, 16, was rescued alive from under a house in Port-au-Prince, 15 days after Haiti's devastating earthquake, French and Haitian rescuers said. 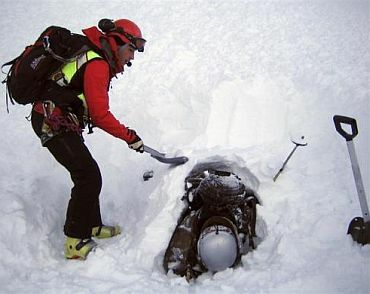 A rescuer (Left) digs out 21-year-old Cedric Genoud in this handout picture at an avalanche site in Evolene on February 7, 2010. Genoud was buried under an avalanche when he was doing off-piste ski in the Swiss alpine resort of Evolene. He was found alive 17 hours later by the rescue team, which noticed moving snow from the helicopter. He was buried under 50 cm (20 inches) of snow and managed to breath thanks to a cavity he had done with his hands around his face. He suffered minor hypothermia. 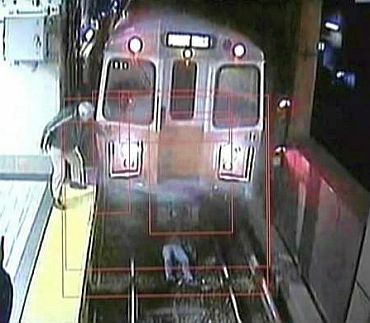 Video grab from surveillance video released November 9, 2009 by the Massachusetts Bay Transportation Authority (MBTA) shows a woman lying on train tracks just as a train was pulling into a station in Boston, Massachusetts on November 6, 2009. The woman walked to the edge of the platform and looked at the approaching train, then lost her balance and fell on to the tracks. People waiting on the platform waved their arms to try to alert the driver to the woman and the driver, Charice Lewis, slammed on the emergency brakes, stopping just in time. Lewis and another MBTA employee were honoured by officials. MBTA transit police said the woman had been drinking. She was unhurt. 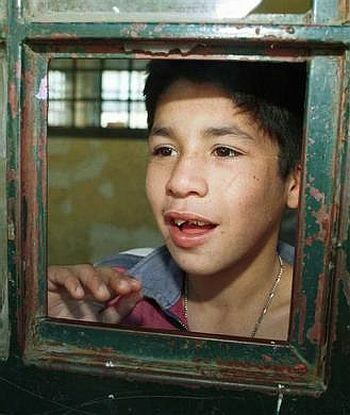 Axel Rivas peeks through the window of a state-run welfare institution in Concepcion, Chile on June 18, 2001. The boy, who was abandoned by his family, survived for years living in a cave in the care of a pack of stray dogs who scavenged for food with him and may even have suckled him. 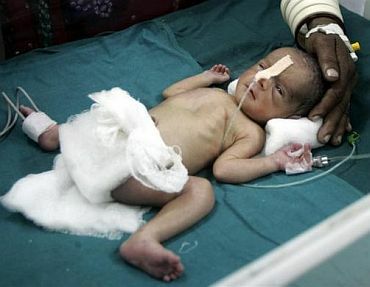 New-born baby girl of Bhuri Kalbi, 33, is seen inside a hospital in Ahmedabad, India on February 28, 2008. The baby girl survived an ignoble birth after slipping down the toilet bowl of a moving train onto the tracks when a pregnant woman unexpectedly gave birth while relieving herself. Fourteen-year-old D'Zhana Simmons of South Carolina, who survived without a heart for nearly four months, cries after thanking her doctors at a news conference at the University of Miami/Jackson Memorial Medical Centre in Miami, November 19, 2008. Simmons was kept alive by a custom-built artificial blood pumping device until she was able to have a heart transplant. 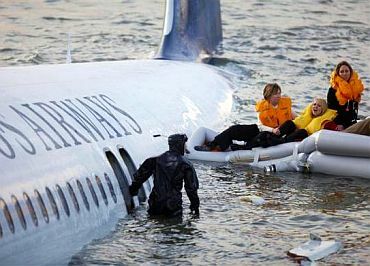 Passengers are rescued after a US Airways aircraft landed in the Hudson River in New York on January 15, 2009. The US Airways jet with more than 150 people on board came down into the frigid Hudson River off Manhattan after apparently hitting a flock of geese and officials said everyone was rescued. Jean-Marie Anigbishe, 45, who was attacked by Ugandan Lord's Resistance Army (LRA) rebels near Ngalima sits with gaping head wounds at hospital in Ngalima in northeastern Congo on February 21, 2009. Anigbishe was fleeing LRA massacres last month and left for dead on the road after he and his brother were attacked by LRA fighters. His brother-in-law was shot and killed and Anigbishe was found unconscious five days later with maggots eating away at his gaping head wounds. 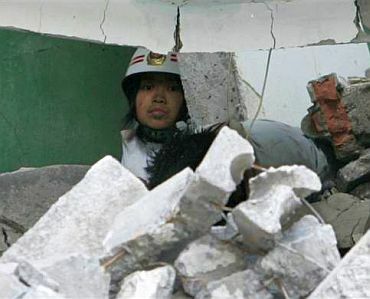 High-school student Yang Liu, wearing a helmet given by a rescuer, has her legs trapped under concrete in the rubble of a collapsed school in the township of Hanwang in Mianzhu city in Sichuan province on May 14, 2008. Yang was fed, given water and a white helmet as workers removed ruins brick by brick from around her. A crane pulled away slabs of concrete -- the remains of the school that parents said had around 800 students before a major quake hit the region. Millie Furlong, 23, from Canada poses for a portrait in a hallway of the Phuket Hospital on September 18, 2007. Furlong, of Prince George, British Columbia, is counting her blessings after having walked away virtually unscratched from a plane crash that killed 89 people on the resort island of Phuket. Face transplant patient Connie Culp is seen in this combination photo made of handouts released to Reuters by Cleveland Clinic on May 6, 2009. Culp, who survived a gun shot to her face, is seen before the attack (Left), before the 22-hour procedure performed in December 2008 (Centre) and in a recent photo (Right) after 80 per cent of her face was transplanted. This was the first near-total face transplant in the United States.